Val Barker achieved a long-held dream to run her own private counselling practice with help from the Small Business Mentoring Service. 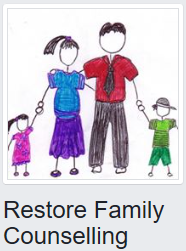 Bendigo-based Restore Family Counselling aims to enable people to live and work together in positive ways despite experiencing difficulties or trauma. Val provides therapeutic counselling to children, young people, adults, couples and families around mental health issues, with a focus on trauma. Techniques used depend on a client’s age and issues. An experienced Anglican Minister and social worker, Val began working towards starting her business in 2013. When her husband died after a short illness in 2014, she decided to develop a private counselling practice while working part time as a welfare worker in two primary schools. Valerie was well qualified and skilled at dealing with those who had experienced trauma. She is accredited in Cognitive Processing Therapy with the Australian Association of Social Workers and Medicare. But balancing two jobs and her own personal grief was challenging. Val did not have a business background, so found it difficult asking people for payment. Val had found SBMS on Facebook and joined its mailing list. The day she questioned her business skills, an email alert arrived for a Women in Business workshop series that included mentoring. “That was the start of it,” she says. “I’ve never looked back”. Val was matched with mentor Janet Cropley, who is based in Maldon. Janet has a strong general management background in a range of private and public organisations. Since 1994 Janet has run a training and consultancy practice, working with small businesses, not-for-profit organisations and educational institutions to seek business improvement through understanding. working on the business and not just in it. While seeing Janet, Val clarified her goals, computerised her administrative tasks and developed a strategy to turn her business into a full-time operation. She also learned to prioritise, say no when required, charge appropriately for her services - although this is still a challenge - and reward herself without feeling guilty. Val’s confidence in herself and her ability grew to the point where she leased a building with another practitioner and purchased furniture and equipment. The rooms have plenty of parking and are close to town, a train station and bus stops. A room is set aside for children and young people who need therapeutic sensory work. Since seeing Janet, Val’s client base has increased ten-fold and revenue is up by 400 per cent. “I went from working two days a week to five and my five are totally booked out a month ahead,” she says. Val is extremely grateful she found SBMS. “I’ve recommended them to several friends and acquaintances,” she says. “Janet was an amazing mentor for me – still is. Mentoring challenged me to understand how much I was worth when it came to my work/money. Janet is proud of what Val has achieved given the incredible stress she faced. She says Val listened to her advice, improved her life balance and her understanding of what is needed to succeed.